What a “coup de torchon” ! 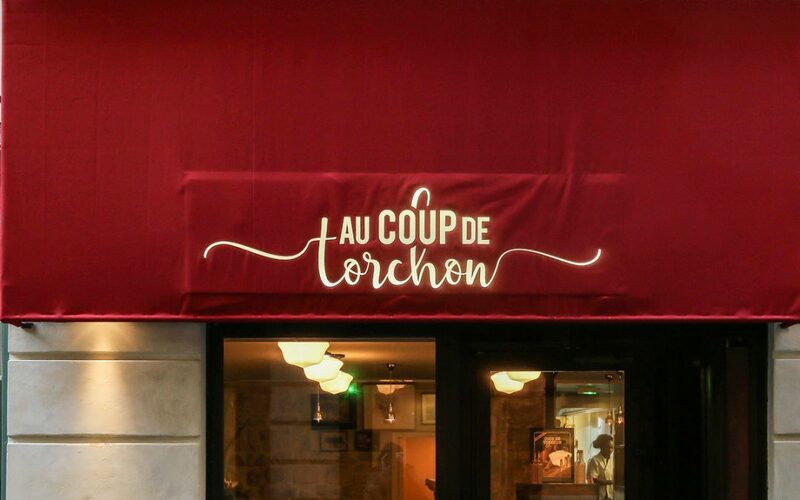 The restaurant “Au coup de torchon”—open since October—is the place that everyone is talking about… After a long career as a talent agent, Frédérique, the daughter of the illustrious and much-loved French actor, Philippe Noiret, turned to her second passion five years ago: cooking. The trigger? No doubt the death of her beloved father, which made Frédérique distance herself from the world of cinema to devote herself to more pragmatic areas. As so often, the realization of such projects is the result of encounters and that with Gérard Marx, the investor, is lasting since their first encounter under the studio-lights 30 years ago, when he was a famous director and she, an assistant. Today, the bubbly Frédérique is starting from scratch as the Manager of the restaurant “Au coup de torchon”, the eponymous name of the film shot with her dad. With her “Chef” diploma in the pocket, she’s been refining her skills both in the kitchen and in the dining area: Manager of a restaurant at rue Grégoire-de-Tours, as well as at the “Le Comptoir Vaugirard” and “Petrossian”, she has one sole and sincere ambition: to please people. A leitmotif to which the restaurant certainly keeps its promise regarding the originality of its food; try the scallop soup with its glazed vegetables, escalopes of foie gras platter or the pumpkin cream soup with orange and you will find… that the prominent part is made with fruits and vegetables, almost exclusively bought from small producers. We were amazed by the excellent value for money, even more so since the menus are changing every day. It’s a “spontaneous” art of cooking, says the Chef, just like Frédérique’s warm, sincere and delighted smile when she welcomes you to her den. “Au coup de torchon”, or literally “The stroke of a Tea towel” (i.e. clearing the table) is a masterstroke at many levels.